Mike Richter - a member of the US Hockey Hall of Fame and a Stanley Cup winner with the New York Rangers - attended Joe's summer schools. Joe's reputation as a goalie coach is known worldwide. He served Team USA as goalie coach for the 1991 Canada Cup, coaching Mike Richter (right) and John Vanbiesbrouck. Now a member of the New York Rangers, Richter came to Bertagna Goalie Schools for two summers as a teenager out of Flourtown, PA. He would later return to work at the camp. 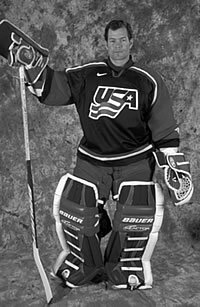 Joe also served with Team USA for the 1994 U.S. Olympic Team, coaching a pair of outstanding goaltenders from the University of Maine, Mike Dunham and Garth Snow. Both Dunham and Snow have gone on to have success at the NHL level, as well. Joe served for seven years as the goalie coach for the Boston Bruins, working with goaltenders such as Reggie Lemelin, Andy Moog, and Bill Ranford. 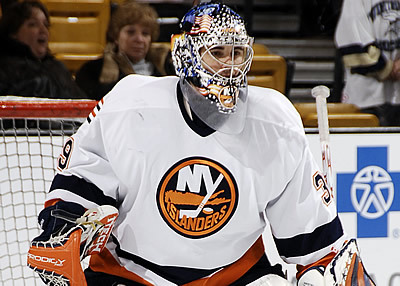 In June of 2000, Bertagna Goaltending Alumnus Rick DiPietro (below) was selected No. 1 overall in the 2000 NHL Entry Draft by the N.Y. Islanders, becoming the first goaltender ever selected first overall. After a stellar freshman campaign with Boston University, DiPietro became only the second collegiate player ever selected with the top pick.